Gaming laptops are now such an important product category that companies are branching out into sub-segments in order to catch buyers' attention with products that stand out. That's how we now have a distinct set of stylish, relatively thin and light gaming laptops, as opposed to hulking beasts designed for nothing but power. Of course there are some tradeoffs in terms of specifications, but these "gaming lifestyle" laptops target more casual buyers who don't necessarily want expensive top-end components anyway. To target gamers, Lenovo has spun its Legion product line out into a major division with quite a broad product portfolio including accessories. The Legion Y530 laptop is aimed at everyday users who want serious gamer cred and the feeling of being part of an elite club, but still demand good looks and versatility — "stylishly savage", as the brand has tagged itself. The Legion name is front and centre, while Lenovo's own logo is consigned to a tiny tag behind the hinge. There are no multi-coloured LEDs or cheesy accents here, but this laptop can still turn heads. Aside from all of that, is it any good at gaming? We're going to find out. 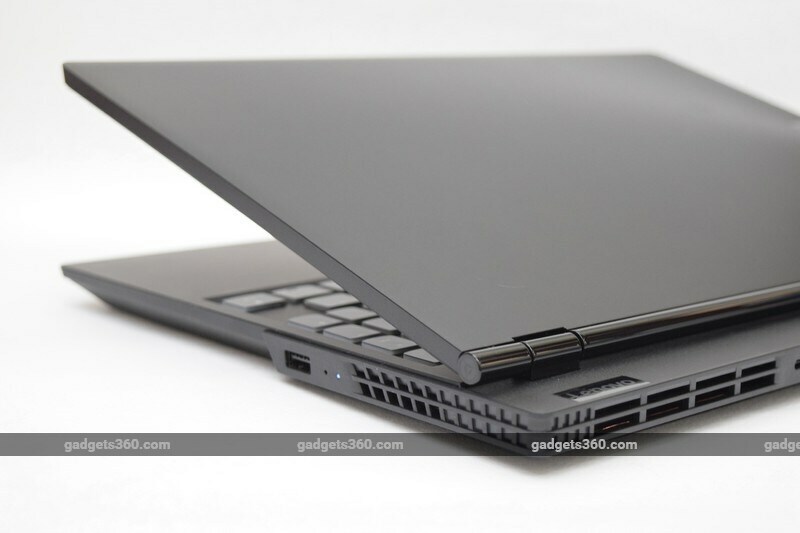 Lenovo has definitely stepped out of the box in terms of design. The Legion Y530 is meant to be stylish and portable, and it definitely stands out from most gaming laptops at this price level. The first thing you'll notice is the hinge, which sits a good inch forward of the back of this laptop. 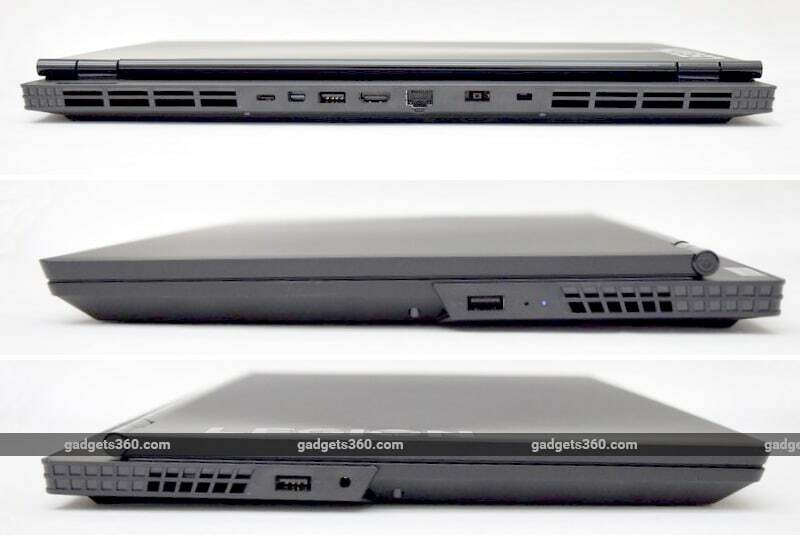 We've seen other laptops with bulges behind their hinges that allow for thicker components or ports to be housed behind them, but the base of the Legion Y530 is completely flat with a lid that just doesn't go all the way to the back. This also means that the lid can be bent backwards a full 180 degrees. There's a glossy black Legion logo on one side, and though it's barely noticeable, a circular ribbed pattern on the lid radiates outwards from the lighted O. We're a bit surprised that Lenovo went with plastic everywhere except the hinge, and the lid does flex and cause warping on screen when a little pressure is applied. At least no one can say that this laptop looks plain or boring. The sides are just as unique — flat towards the back, and then dramatically cut off and angled as the lines move forward. That leaves almost no room for ports. There's one USB 3.0 port on either side, and also a 3.5mm audio socket on the left, but the bulk of the connectivity is at the rear. Here, you'll find the power inlet, Ethernet port, HDMI 2.0 output, another USB 3.0 port, and finally a USB Type-C port (5Gbps) which also supports DisplayPort video output. You can see heatsinks through the grilles on either side of the port cluster, and if you flip this laptop over, you'll see two rather large blower-style fans through a metal mesh panel. Lenovo is quick to point out the Legion Y530's "edgeless" screen, and the frame is actually quite narrow on three sides. There's a nearly 3cm chin though, and unfortunately, this is where the webcam has been accommodated. Unlike when we've seen this arrangement before, the camera hasn't been angled upwards, so everyone you're chatting with will really only see your neck and shoulders unless you hunch very uncomfortably or tilt the screen way back. Not everyone cares about a webcam, but gamers who intend to stream themselves while playing should absolutely keep this in mind. Lenovo has gone with an interesting keyboard design that tries to make room for a full-sized arrow block as well as a number pad. The relief of having a desktop-quality arrow block is immense after having dealt with way too many laptops with squashed layouts. There are still some tradeoffs — Pause/Break has been dropped, PrintScreen is on the bottom — but overall, this is a neat use of space. There are a lot of Fn-combo shortcuts scattered around, but Lenovo hasn't used a different colour to help people find them. You get two levels of white backlighting, and the keycaps have transparent sides that can get a bit distracting when trying to focus on a game on screen. As for typing comfort, we found the keyboard to be quite good. There's only very slight flex in the centre. The switches are crisp and springy while still being surprisingly quiet. The trackpad has two physical buttons, but they're very plasticky and flush with the flat palmrest, making them difficult to press. The trackpad itself is a bit lacking when it comes to fine movements but it should suffice for casual use, and you're going to have a mouse for gaming anyway. At 2.3kg, the Legion Y530 is relatively easy to carry around. It will fit in most everyday backpacks and won't weigh you down much more than many mainstream 15-inch laptops. This laptop is 24mm thick, but the narrow screen borders show that Lenovo has tried to reduce bulk without dropping the screen size. This is a viable portable gaming laptop, rather than one that sits on the same desk all the time. Our review unit is the middle of three variants that are currently being sold in India. It has an Intel Core i5-8300H CPU, which is based on Intel's current 8th Gen Coffee Lake architecture. It has four cores with Hyper-Threading, and a 45W thermal envelope rather than the 15W that thin-and-light laptops aim for. It has a 2.3GHz base speed and can boost up to 4GHz. If you choose the top-end variant of this laptop, you get a six-core, 12-thread Core i7-8750H CPU. Nvidia has recently launched new top-end desktop GPUs, but there are no mainstream or laptop versions of them yet, leaving us with the now dated and common GeForce GTX 1050 Ti. It has 4GB of GDDR5 memory of its own and delivers a balance of cost and performance. The lowest priced Legion Y530 drops this down to a GeForce GTX 1050, with the Core i5-8300H and all other specifications remaining the same. All three variants have 8GB of RAM, a 128GB NVMe SSD, and a 1TB hard drive. We understand the balance that Lenovo has tried to go for, but 128GB is barely enough for three or four of today's best games. The 15.6-inch 1920x1080-pixel screen looks commanding, thanks to its raised position and narrow sides. Everything is sharp and we didn't need to push the brightness up beyond 50 percent under office lighting, expect when gaming. Colours are just a little muted, but not enough to make videos and photos look too dull. We changed the default Windows 10 scaling from 125 percent to 100 and found it much more comfortable to use. Other specifications include a non-user-replaceable 52.5Wh battery, Wi-Fi 802.11ac, and Bluetooth 4.1. One thing we missed sorely was an SD card slot. You get a hefty 135W charger with this laptop. Lenovo's India website mentions options for Intel Optane Memory and 144Hz screens as well as better RAM, storage and GPUs, but these are not available in any of the variants on sale in India. You get Windows 10 Home, a one-year McAfee LiveSafe subscription, and a few Lenovo utilities. Lenovo Vantage shows your battery level percentage right on the Windows taskbar and lets you disable the laptop's mic, webcam and touchpad, cycle through backlight levels, allow USB devices to draw power when the laptop is not running, and set a blue light filter level. You can also force a rapid charge cycle which could come in handy. Lenovo App Explorer is a pointless app store that can be ignored. 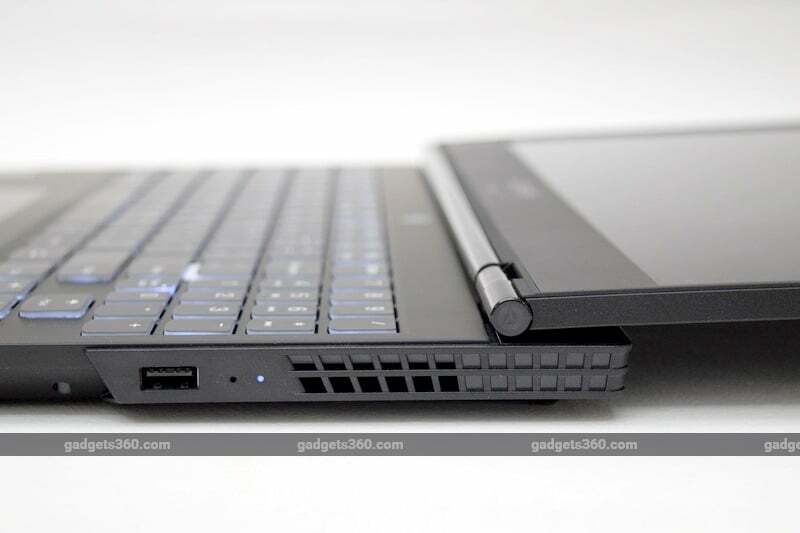 Finally, the Legion Y530 has a pinhole on the right that triggers Lenovo's Onekey Recovery tool to help you create backups or restore Windows to its factory state. As far as everyday use goes, we were happy with the Legion Y530 and never found it to be sluggish. There were a few annoying McAfee popups, but everything was smooth sailing otherwise. The non-glossy screen is a pleasure to use, and the thick chin raises it to a level that's more comfortable than usual. We love the fact that the stereo speakers are placed on the front lip of this laptop, firing forwards, but everything sounded way too shrill and there was awful distortion at high volume. 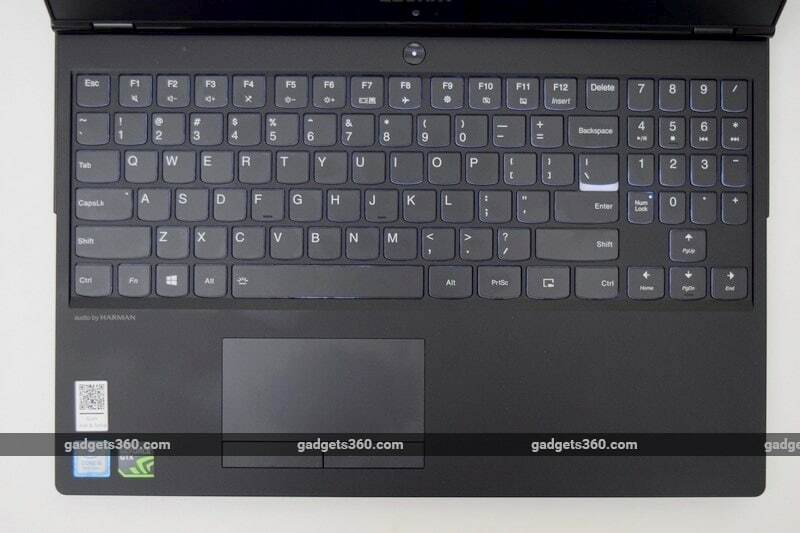 Our benchmark tests showed that this laptop can handle all kinds of heavy work. Cinebench R15 gave us single-core and multi-core scores of 165 and 807 respectively. PCMark 10 Extended gave us 4742 points. We used 7zip to compress a 3.24GB folder of assorted files, and it took 4 minutes, 10 seconds. We then transcoded a 1.3GB 1080p AVI file to 720p H.265, which took 1 minute, 17 seconds. Blender's BMW benchmark ran in 9 minutes, 46 seconds. The SSD posted impressive sequential read and write speeds of just over 1GBps, while random speeds averaged roughly 540MBps. The hard drive was of course much slower. Far Cry 5's benchmark ran smoothly at 1920x1080 with the High preset. We got an average frame rate of 43fps, which is pretty respectable. On the other hand, Deus Ex: Mankind Divided struggled, with an average of 34.1fps but quite a lot of stuttering and screen tearing. We also saw a lot of tearing in Metro: Last Light Redux's built-in benchmark and saw that while the average frame rate at 1920x1080 (Very High quality) was as high as 69.19fps, frame timings were all over the place. You'll have to drop the quality settings in lots of games to have a decent experience, which is normal for a gaming laptop at this price level. We had a great time playing through Rise of the Tomb Raider at 1920x1080 using its High preset with FXAA enabled, and there were no problems even in heavy fight scenes. The built-in benchmark showed an average of 55.79fps. Doom also ran without any trouble whatsoever, even at its Ultra preset, and the on-screen counter showed us frame rates well in excess of 100fps at all times. Finally, we checked out The Witcher 3: Wild Hunt, and while it struggled at the High presets for graphics and post-processing, we got a very steady 61fps at Medium settings. Frame time analysis showed very little deviance from the 16.1ms average, which means that you won't be able to perceive microstuttering. We did notice the Legion Y530's fans when gaming or running heavy tests, but the sound was not enough to be distracting. Hot air is expelled backwards and out from the back of both sides, far enough that it didn't affect our comfort when using a mouse. The right side of the laptop became quite warm, but the WASD keys and left wrist rest that you'll be using for gaming were perfectly fine. We used Battery Eater Pro to test battery life, and the heavy 3D simulation lasted for only 1 hour and 1 minute before the laptop shut itself down automatically, but lasted another 13 minutes after we found that odd and turned it back on. This behaviour could give you that tiny reserve of power that you sometimes need in a pinch. With very light use consisting only of continuous typing and Web surfing with just a little video streaming, we barely got through an 8-hour workday. We weren't happy with the webcam or lack of an SD card slot, and not everyone will love the ports on the rear. However, this laptop has a lot going for it. performance was pretty good all around, and there's no denying how portable the Legion Y530, for a gaming laptop. We think that a lot of people who buy it will do so because of its style. It isn't easy to look different, but this is a product that stands out without calling too much attention to itself. If you're thinking of spending a lot of money on a gaming laptop, you should keep in mind that we're long overdue for a GPU refresh from Nvidia — lack of competition from AMD notwithstanding — so don't be too surprised if better models are released within the next few months. 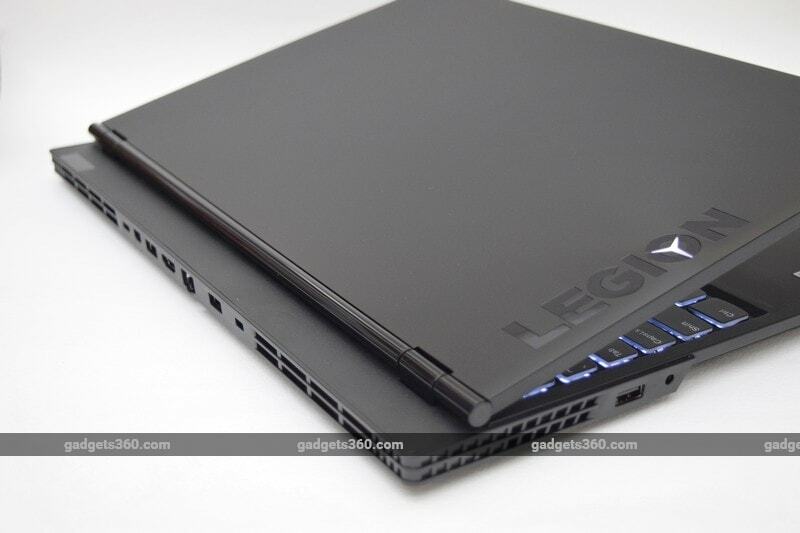 product Lenovo Legion Y530 is a portable and stylish gaming laptop that might not have the best specifications, but could fit the needs of many buyers. Read our review for more.